Mission: The SNAP to Success program aims to build upon IDHS's current SNAP Employment & Training (E&T) program by leveraging a new federal funding stream to partner with new providers and ultimately help thousands of additional SNAP participants find employment, advance in their careers, and achieve self-sufficiency. The Basics: What is SNAP Employment & Training (E&T)? E&T programs help SNAP participants achieve employment and self-sufficiency through education, skills training, supportive services, and employment. Services and training are currently funded by the State and federal government, but funding can come from a variety of other sources as well. 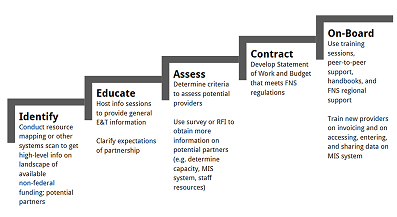 SNAP E&T's flexibility allows integration with existing workforce programs (e.g., WIOA). SNAP E&T services are a collaborative effort between IDHS, the federal government, and our provider partners. What are the types of allowable services? SNAP to Success allows Illinois to maximize 50 Percent Funds through third-party partnerships. Partnerships between IDHS and providers recognize the expertise of providers and diversity of provider offerings. SNAP participants benefit from a larger network of providers offering broader, more diverse services. Federal match allows providers to expand resources and serve more individuals. To receive the federal match on allowable services, providers submit documentation to IDHS, who then submits it to FNS and serves as the pass-through entity for the matching funds. IDHS and provider enter into partnership. Provider serves SNAP participant and submits documentation to IDHS. DHS submits expense documentation to FNS. FNS issues 50% reimbursement to IDHS..
To receive the 50% federal match, providers must fund allowable services with non-federal funds. There are a number of allowable non-federal sources. Has demonstrable and verifiable data or sustained success in measurably achieving credentials and/or employment that leads to self-sufficiency. 3rd Party Claiming can be administratively complex. Providers must verify participant SNAP eligibility. IDHS and providers must anticipate service levels throughout the year. Providers and IDHS must track and document non-federal funding sources. Providers must verify non-federal funds they will utilize. Financing for providers can be difficult, especially for community-based organizations without existing connections to foundations or other donors. Educate - Host Info sessions to provide general E & T information. Clarify expectations of partnership. On-Board - Use training sessions, peer-to-peer support, handbooks, and FNS regional support. Train new providers on invoicing and on accessing, entering, and sharing data on MIS systems.